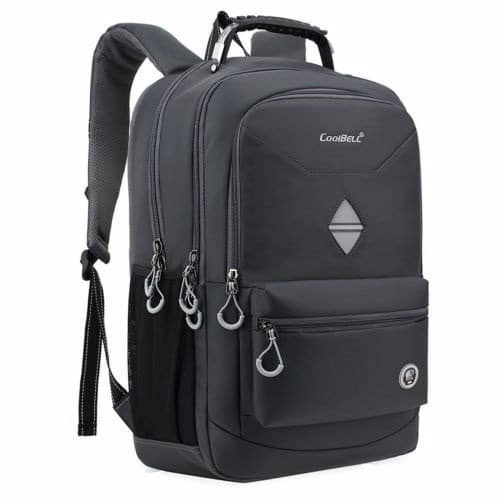 Cool-Bell Waterproof 18.4 inch Portable Backpack Shockproof Business Backpack Bag has three compartments and one front pocket. Main Compartments is designed for keeping laptops, Tablets, clothes etc, Middle compartment for keeping items like IPad, Books, documents etc. while the small front compartment with small pocket is for keeping phones, cards, power-bank, power-cord etc. The Protective laptop compartment can be adjustable to fit 13-18inch laptop so convenient and roomy for a long trip anywhere. Personalized good looking appearance, ideal for using as book bag, rucksack schoolbag, satchel, casual daypack for daily use at school, work, weekend, outdoor holiday, outdoor activities, occasional travel, gyms, hiking, biking etc. Nice size admirably suits college students, teen girls’ boys and adults. Oxford cloth materials and waterproof polyester lining provide functions of rain resistant, scratch proof, durable, never fades though washed. Built in shockproof foam padded protects the laptop or other electronics from being impacted and prevent of accidental drop.